It used to be that turkey was a big part of our holiday celebrations, and while never as popular as pork, I have to say that our Turkey a la Dominicana was most certainly firmly steeped in tradition. There’s even a couple of old carols that mention it. Somewhere along the way turkey became an uncommon dish. We think of it more as a U.S. tradition, and our Puerco Asado remains king as the centerpiece of our holiday feasts. Even chicken is more common nowadays. My grandparents used to have turkeys on their farm. They certainly didn’t look like the kind of turkey we buy in supermarkets nowadays. They were scraggly, skinny birds. The meat was lean, flavorful but tough, as is usual with free-range animals. This is why the Dominican style of seasoning and marinating for a long time works so wonderfully with this meat. It works not unlike the traditional U.S. method of brining, only that this infuses the meat with some very strong flavors, and tenderizes it a whole lot more. I was never that inspired to add a recipe for a Christmas turkey in our blog. I really don’t know why. Or maybe I do. I thought turkey was an uninspiring meat: dry, flavorless. I know, I know. I am now duly chastised. Let me tell you something: I am so incredibly proud of this recipe. It worked like a charm, and I’ve never changed my mind about a food so dramatically since transitioning from a kid who hated eggplant to an adult who can never have enough of it. No turkey I’ve ever had before measures up to this one. This Turkey a la Dominicana stuffed with Rice and Pigeon Peas is incredibly flavorful, the meat was fall-off-the-bone tender, unexpectedly juicy, and the rice inside soaked all the runaway flavors, so it was just like an explosion of flavors. It’s no secret that I’m not a real meat-eater, but this I ate with gusto. I bet you will too. Turkey a la Dominicana Stuffed with Rice and Pigeon Peas Recipe: Exquisitely seasoned, impossibly juicy, a traditional dish rediscovered and improved to make your Christmas shine. Heat the oil in a 1/2 gl [2 lt] iron pot over medium heat, and add the cilantro, garlic, peppers, oregano and salt and cook and stir for a minute. Add the peas, also while stirring. Once well heated, add water and bring to a boil. Stir in rice and simmer over medium heat, stirring regularly and removing as much as you can of the rice that sticks to the bottom. When all the water has evaporated set aside half of the rice to stuff the turkey, and cover the pot with the remaining rice with a tight-fitting lid and simmer over very low heat. Simmer for 20 minutes. Move the rice from the bottom to the top so it cooks uniformly. Cover again and simmer another 5 minutes. Uncover and taste for doneness. The rice should be firm but tender inside. If necessary, cover and simmer another 5 minutes over very low heat. Spoon into a serving bowl and keep covered until it's time to serve. 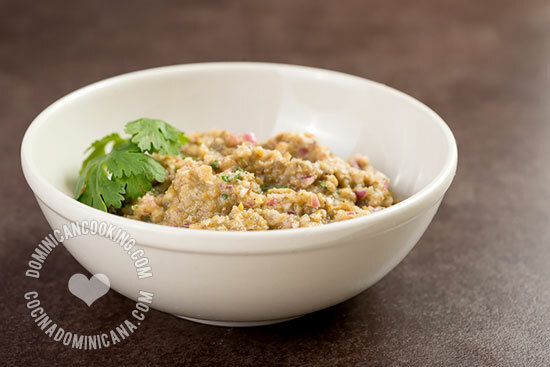 Mix the ingredients for the seasoning and blend in the food processor to obtain a coarse paste. Slowly work your hand between the skin and the turkey meat, making sure not to pierce through the skin, separating as much as possible all the way down to the legs and neck (we're no skinning the turkey, just making space to rub seasoning under the skin). With a sharp knife carve 4 small holes into each side of the breast meat (don't pierce the skin!) and stuff them with the seasoning. Rub the rest of the seasoning under the turkey skin and inside the cavity. Place the turkey in a lidded container and refrigerate for 24 hours. Heat the oven at 325 ºF [160 ºC]. Remove the turkey from the fridge. Spread 3/4 of the butter under the skin. Stuff the holes you carved with some butter, set aside the rest. Mix browning and water. Paint all over the skin with the browning. Stuff the turkey with the half-cooked rice. Place on a baking tray with a wire rack (see notes). Pull the skin to cover the turkey all over. Tie the legs with twine. 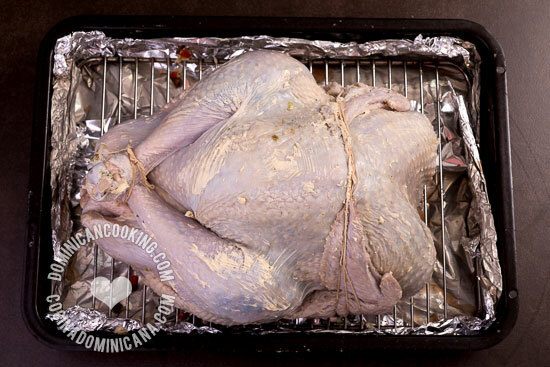 Tie the wings tight against the skin by wrapping twine around the turkey. Then brush all over with butter, save the remaining butter for use later. Roast the turkey for 2 1/2 hours, brushing all the exposed skin with butter every half hour. Once the 2 1/2 hours have passed, test the turkey breast with a meat thermometer. It should have reached 165 °F [74 ºC] when you hit the bone. You should also test inside the leg where it hits the ribs. If it hasn't reached that temperature, cook for another 20 minutes and test again. If you don't have a meat thermometer, stab inside the thigh al the way to the bone, it is done if the juices run clear, and there's no sign of blood or pink meat. Cook for another 20 minutes, if necessary, and test again. 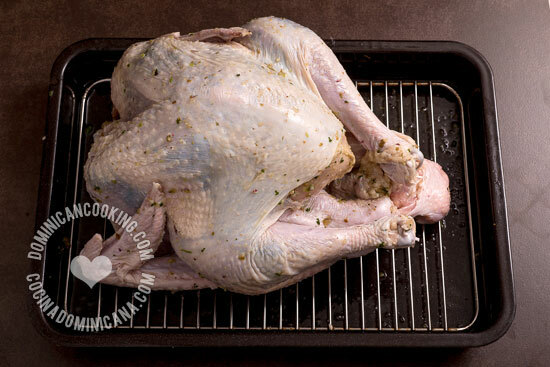 Once done, remove from the oven and cover with aluminum foil. Let it rest for 20 minutes before serving. Serve alongside the rice you cooked aside. When it's time to eat mix the rice stuffing with the rest of the rice. For easy cleaning, line the bottom pan with aluminum foil, as in the photo. You don't need to stuff the turkey with Moro de Guandules, but let me tell you, you really ought to, it soaks up those flavors like a sponge. I could stuff my face with it all day. You don't really have to use the browning, but it gives the turkey a really nice color. I recommend it if you can buy it. Wow, this recipe landed at the very best time!! Thanks so much Clara, my canadian family will surely appreciate it! Winter festivities the Dominican way! I wouldn’t know. I have never used one.